Snurr, who is the John G. Searle Professor of Chemical and Biological Engineering, and his group have discovered a way to rapidly identify top candidates for carbon capture — using just 1 percent of the computational effort that was previously required. By applying a genetic algorithm, they rapidly searched through a database of 55,000 MOFs. The volume of some MOF crystals might be the size of a grain of salt, but the internal surface area, if unfolded, could cover an entire football field. Supported by the US Department of Energy, the research appeared online today in the journal Science Advances. Yongchul G. Chung and Diego A. Gómez-Gualdrón, former postdoctoral fellows in Snurr’s laboratory, were the paper’s co-first authors. 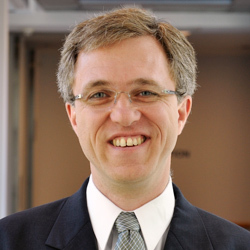 Northwestern chemistry professors J. Fraser Stoddart, Joseph Hupp, and Omar Farha contributed to the work as well as Fengqi You, former professor of chemical and biological engineering at Northwestern. With their nanoscopic pores and incredibly high surface areas, MOFs are excellent materials for gas storage. MOFs’ vast internal surface areas allow them to hold remarkably high volumes of gas. The volume of some MOF crystals might be the size of a grain of salt, for example, but the internal surface area, if unfolded, could cover an entire football field. Snurr’s previous work has explored how to use MOFs to capture carbon from existing power plants during the post-combustion process. About 10 to 15 percent of power plant exhaust is CO2; the rest is mainly nitrogen and water vapor. 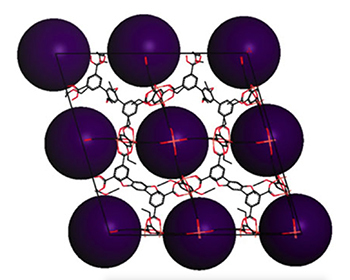 Snurr and Hupp designed a MOF that can sort these gases to capture CO2 before it enters the atmosphere.